The island of Krk is the northernmost island in the Mediterranean and is located in the Kvarner Bay. It is the biggest island in the Adriatic with the area of 409.9 km2. 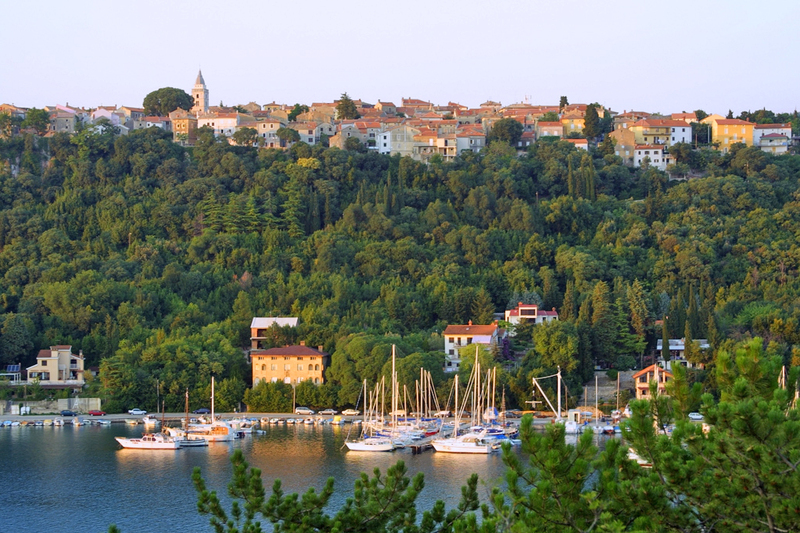 The island of Krk has the largest number of populated villages – a total of 68. The island of Krk is located in the area of moderate and mild Mediterranean climate. The average summer temperature is 23o C while the average sea temperature is 20o C.
The most common local winds are bura, jugo and maestral. There is no rain on the island in July, with little precipitation in June, August and September. In Omišalj, the beginning of tourism dates back to the beginning of the twentieth century. On the beaches, there are 14 blue flags. Along the island of Krk, there are walking and cycling trails long 300 km. The island is also one of the sunniest parts of Europe with 2500 sunny hours per year. The island of Krk abounds with historical monuments, and because of its remarkable beauty, in ancient times the island was known as Insula Aurea-golden island. Dating from the year 1100, the birth certificate of Croats – Baška tablet was created on the island of Krk. The first inhabitants of the island were Illyrian tribes of Iapodes and Liburni, followed by the ancient Greeks who considered the island part of the Apsyrtides islands, while nowadays the island pertains to the Kvarner Bay islands. The ancient Roman remains date from just before the Christian Era and after the Christian Era. A unique plant “Barbašova lazarkinja” (Asperula Borbasiana) is a world endemic specie and grows only in the Baška Bay. Healing mud can be found on the island, more precisely on the west side of the Klimno Bay. An ornithology reserve on the island of Prvić and the north-eastern, steeper part of the coast of the island of Krk is the northernmost habitat of Griffon vultures in the coastal zone. Park Dubec, the Bay Sepen and the ancient town Fulfinum, Biserujka Cave, healing mud at Melin, the Lake (area: OMIŠALJ – KLIMNO – ŠILO). St. Mary Magdalene Monastery, the biggest oak tree on the island, the monastery in Glavotok, early Romanesque Church of St. Krševan (area: MALINSKA – GLAVOTOK). Mrgari, Obzova, the stream of Vretenica, the Vrbnik field, the small chapel of St. Mary Magdalene, the small island of Košljun, the forest reserve and the cultural monument in Puntarska draga. In the Franciscan monastery, with the Church of the Mary’s Annunciation from 1480 A.C., there is a valuable library and an ethnographic museum. (PUNAT – VRBNIK). A small church of St. Marak, Frankopan castle Gradec, the remains of the roman villa in Šilo, the Way of the Cross in Glagolitic script (DOBRINJ – VRBNIK). The small church of St. Lucia in Jurandvor, the ornithology reserve Kuntrep and the pool of Diviška, wells of Draga, the ancient settlement and fortification Corinthia (BAŠKA – STARA BAŠKA). Dry stone walls; the church of St. Dunat (9th century) in the proximity of the village Kornić; the lake Ponikve; Škalice; the sacral complex of the Cathedral of the Virgin Mary’s Annunciation dating from the 5th century, together with the church of St. Kvirin, the patron of the town; the Square Kamplin with the Frankopan castle and a square shaped tower; and a 500 years old olive tree (KRK – VALBISKA). From the island of Krk, tourist can easily reach the following national parks: Plitvice Lakes, Brijuni, the Northern Velebit and Risnjak. Organised bus or boat tours to the nearby islands: Rab,Cres, Lošinj,Grgur, Goli, Košljun, and to the nearby towns: Rijeka, Pula, Opatija are available. Night tours by boat and night fishing are part of the island’s tourist offer as well. Walking and cycling tours, sailing, diving, and other sport activities are available.